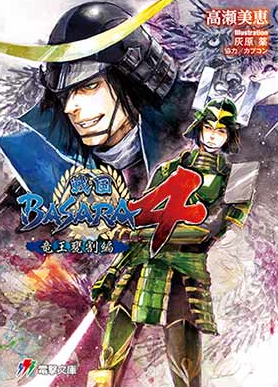 The mysterious rerelease of Sengoku Basara 4 has now been formally announced. 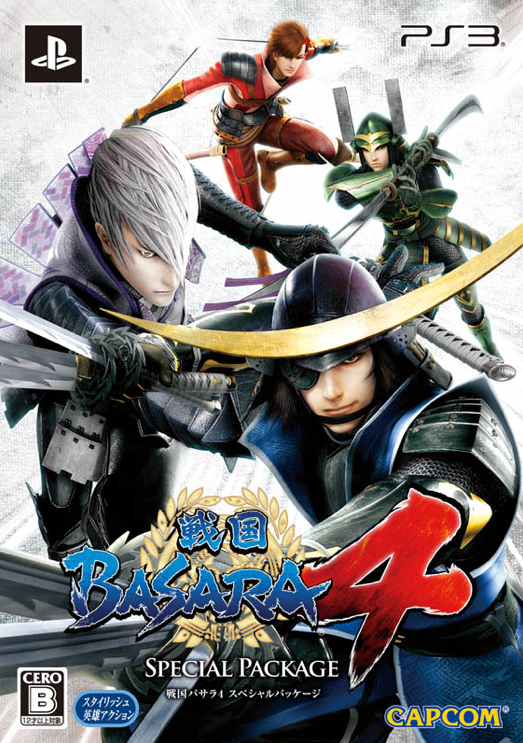 As per the rumours it will come out on 24th July 2014 for ¥4,490 (excluding sales tax) and include the game, all nine of the DLC costumes, the special custom theme given to people who collected all of the costumes and a Sengoku Basara 4 video DVD. In addition, the game will have the option to unlock all characters right from the start (this feature is currently available separately as paid DLC). There will also be a PSN edition of the pack which includes everything except the bonus DVD for ¥4,157 (excluding sales tax). The box art for the 'special package' version is below. Hot on the heels of the recent Yasashii Piano Solo: Capcom Game Collection ~30th Anniversary~ book comes Yasashii Piano Solo: Sengoku Basara Best Selection, another collection of sheet music to help pianists play classic themes from the history of the series. This 88-page book will be released on 25th June 2014 priced at ¥2,000 before tax, and it will include a character sticker as a bonus. January's Sengoku Basara 4: Basara Matsuri 2014 ~Shinshun No Utage~ event is finally coming to DVD on 9th July 2014 priced at ¥5,000 before tax. 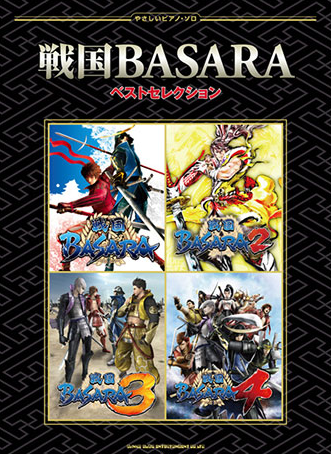 The first batch will only be available to customers who order through the Basara Club shop, e-Capcom or Otomart; other stores won't be shipping their copies until 20th August 2014. The pack will include a colour booklet together with a single DVD in a clear case. Disappointingly, the DVD only includes 110 minutes from the evening show and 90 minutes of extras (clips from the afternoon show and backstage footage). Both shows were very similar but it's a shame that the whole afternoon performance will never be available on disc. Capcom's official online store e-Capcom has added a bunch of new merchandise and declared that this week will be a 'Date Festival' with special pricing on some Sengoku Basara items. There are also four new sets of fantastic new products on the way to tempt fans who already have everything they need. 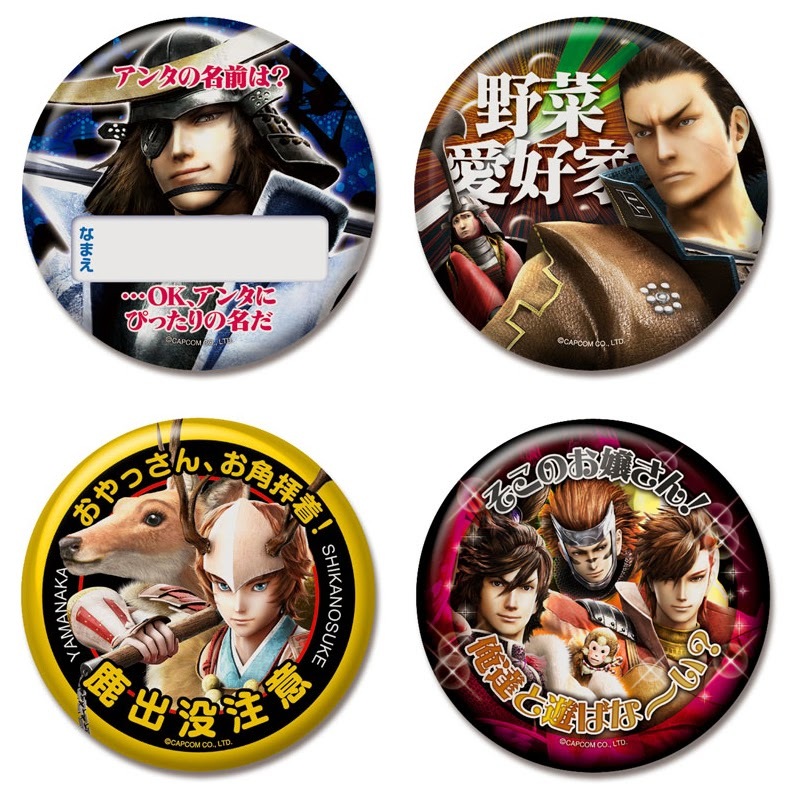 The first of these takes the form of four new designs for the Sengoku Basara 4 Badge Collection. They'll be priced at ¥450 each when they're released on 28th August 2014, and it's worth noting that they're extra large badges (hence the higher price). Like before, there's a playful theme. Masamune's is a name badge, Kojuurou and Kingo are labelled 'the vegetable enthusiasts', and Shikanosuke's badge has a cautionary sign advising that deer might appear. My favourite is probably the last one where Sasuke, Keiji and Sakon team up to appear as charming as possible - the text is an embarrassingly cheesy chat-up line. 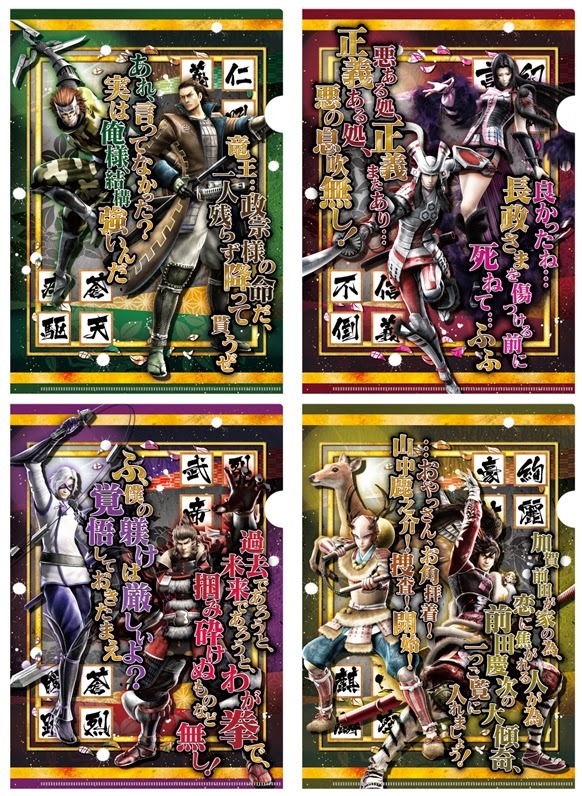 For the stationery collectors out there, four new Sengoku Basara 4 Clear Files are due for release on 28th August 2014 priced at ¥350 each. This time each file will depict two characters: Kojuurou/Sasuke, Nagamasa/Oichi, Hanbee/Hideyoshi and Keiji/Shikanosuke. Next up is a pair of gorgeous fully-printed t-shirts in a choice of Ieyasu and Mitsunari designs, each priced at ¥7,500 before tax, to celebrate the finale of the Sengoku Basara 3 Bloody Angel manga. The t-shirts will be released in S, M, L and XL sizes in late August 2014. A postcard replica of Itou Ryuu's illustration titled 'Bloodstained Fallen Angel' will be included as a bonus for fans preordering through e-Capcom. Saving the best until last, a pair of jerseys themed around Motonari and Motochika has been unveiled. Each will cost ¥9,800 before tax when they are released in late November 2014. They're available in S, M, L and XL sizes and expected to sell out quickly. As a bonus, fans who preorder either jersey from e-Capcom will receive a postcard of both characters illustrated by manga artist Itou Ryuu. I cannot get over how ridiculous that hood looks on the Motonari design. Amazing! e-Capcom doesn't ship internationally so it may be necessary to use a proxy buying service for some of these products - in particular, the t-shirts and jerseys have been confirmed to be exclusive to the Akita Shoten and Capcom online stores. 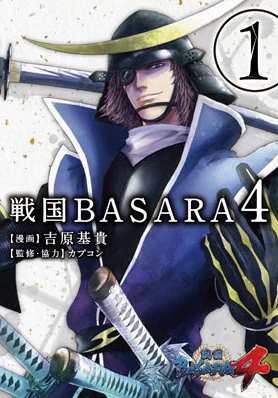 July's Sengoku Basara 4: Ryuuou-Kamewari-hen ('Dragon King/Urn-Splitter Arc') novel has its final cover artwork up as well. In addition, fans who purchase the final volume of Sengoku Basara 3 Bloody Angel at Animate will receive a comical illustrated pamphlet to go with their purchase. The Basara Club online shop has updated with some other goodies as well as the event DVD - and most of the new items are exclusive to its members. They've added the old merchandise from the defunct Eiyuu No Kai fan club, some leftover items from the Basara Club fan meeting events earlier this year and the 'second season' of exclusive goods such as a two-piece sticker set (¥1,080), a two-piece mini notepad set (¥864), a smooth hand towel (¥1,296) and four IC card decoration stickers available in Yukimura, Ieyasu, Hanbee and Keiji designs (¥540 each). Whew! That was a lot of new merchandise. I'm expecting even more updates about the anime any moment now too, since Tuesday is when all of the June mainstream anime magazines appear in stores. I'm sure Capcom are working on making even more news to keep us all busy, haha.